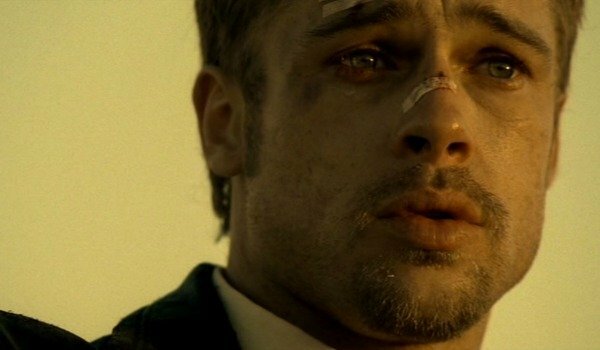 Se7en is regarded as the definitive David Fincher film. Not only does the bleak thriller embrace its grim and anti-Hollywood agenda with glee, but Fincher uses every cinematic trick available to keep the audience glued to the precipice of their seats, while slowly lulling them into his horrid world. The main reason why it’s seen in this light, though, is because of its powerful yet haunting conclusion, the lynchpin of which is a certain box that John Doe has delivered to Agent Mills and Agent Somerset in the desert. But why has Se7en stood the test of time? Why was its ending so memorable and effective? And just how close did the studio come to changing it? This feature will rehash what happened at the end of David Fincher's Se7en, and also run through a series of alternate endings that almost concluded the brilliant film. Having been one-step behind John Doe (majestically played by Kevin Spacey) throughout the entire film, Detective David Mills (a caustic Brad Pitt) and Detective Lieutenant William Somerset (a sage and perfect Morgan Freeman) catch a break when Doe promises to confess to the murders. But only after Somerset and Mills drive him out to a remote desert area. Once there, a delivery van approaches. Somerset goes to the van leaving Mills to watch Doe, who then tantalizingly explains to the detective that earlier that day he visited his home and took the head of his pregnant wife, Tracy (Gwyneth Paltrow). Meanwhile, Somerset opens up the package from the delivery van and discovers Tracy’s decapitated dome inside. Mills snaps and shoots the serial killer dead, rounding off cinema’s gloomiest ending since Chinatown. But why did Doe commit his final atrocious murder and reveal it in this fashion? Because it was all part of his master plan to link each of his murders to the seven deadly sins. 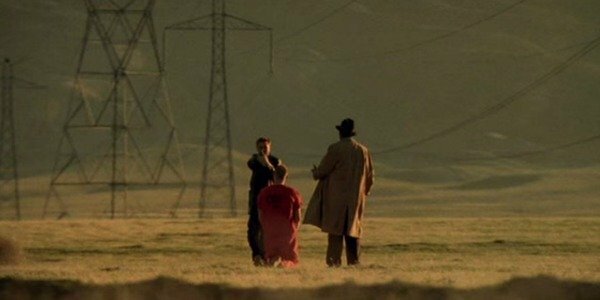 Throughout Se7en, the sins of lust (prostitute), gluttony (the obese man), greed (the lawyer), sloth (drug dealer/child molester) and pride (model) are each punished by death (Quick side-note: I’m going to put it out there and declare that Se7en’s sins are the greatest Macguffin in movie history. You heard me, Hitchcock!). 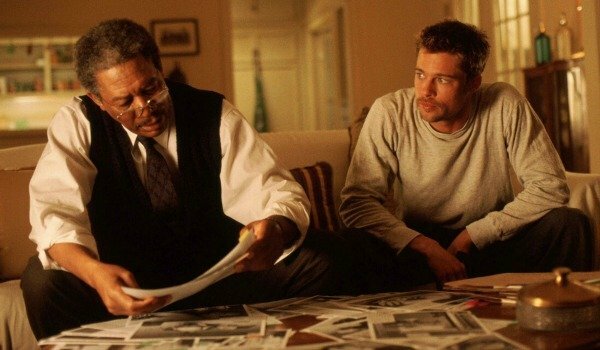 Se7en's finale sees the sins of wrath and envy ultimately committed by Mills and Doe. Doe explains to Mills that he tried to live out his normal life of being happily married and in love with a beautiful woman. But he failed, and thus committed the crime of "envy" by decapitating Tracy. 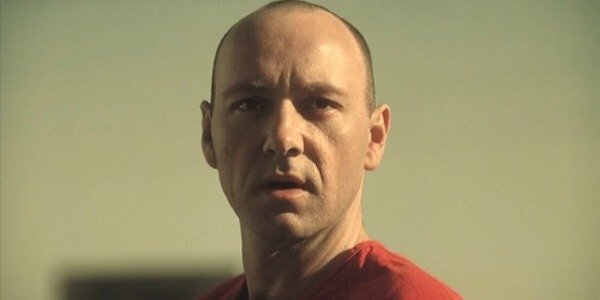 An apoplectic Mills is unable to contain himself and then shoots Doe in retaliation (David Fincher allows a flash of Tracey’s face to appear for a frame just before Mills kills Doe to show just how instinctive and vengeful the killing is). Thus Mills becomes wrath. Just to highlight the link to these crimes, Doe’s apartment (which Mills and Somerset visited earlier in the film) is 5A (wrath is the 5th sin), while Mills shoots Doe six times (envy is the 6th sin). Yet, despite underlining the villain’s main hypothesis that the world is a torrid place and we all have the capacity to be evil, Se7en doesn't end on a completely sour note. That's because Somerset indicates that he will forgo his relocation upstate to "be around" for Mills. The last words we hear are Somerset paraphrasing an Ernest Hemingway quote, and declaring, "’The world is a fine place, and worth fighting for’ … I agree with the second part." That suffix ends Se7en on a subtle note of optimism. This wasn’t what Fincher had in mind though. 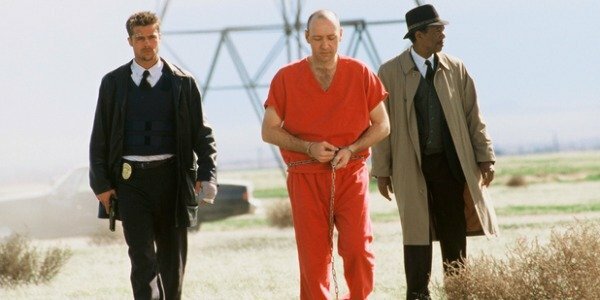 In fact, the director fought long and hard with the studio to conclude Se7en in a truly downtrodden and overwhelming sour fashion. And he essentially lost. Click over to the next page to learn the multiple ways that Se7en almost ended. Some of them are just mindboggling. Se7en only piqued David Fincher’s interest after New Line accidentally sent him the original draft with the head in the box ending. In fact the studio had initially rejected this version, and then only bought the script after Kevin Andrew Walker had incorporated a more traditional, action-orientated conclusion. According to Rant Hollywood, producer Arnold Kopelson made Walker re-write Se7en so that Mills and Somerset embarked on a race to save Tracy’s life for the film's final moments. Unfortunately further details regarding just where and how Tracy is at that point are at a premium, but it’s known that Pitt, Freeman and Fincher all immediately rejected it, and insisted they wouldn’t make the movie if it was kept in. It’s clear from the effort they exterted tryin to change it that Se7en’s producers were never comfortable with the scripted ending. In fact, after the above action-ending was rejected by the aforementioned trio, a sequence was storyboarded where Somerset decides to kill John Doe in order to save Mills. After discovering the head, Somerset declares that he "wants out," and shoots John Doe to stop his foe’s plan from coming to fruition. 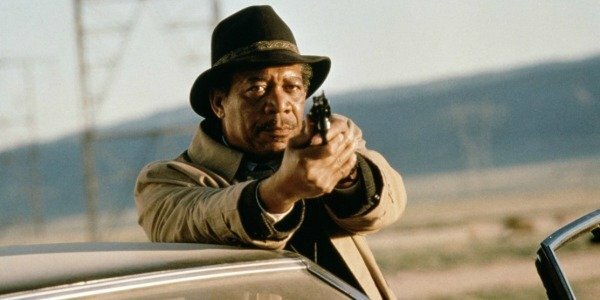 Freeman insists on Se7en’s commentary, via Film School Rejects, that he liked this ending, as it means that Mills would still have had a life. However, Pitt believed that it would have never worked, because there was no way Mills wouldn’t have shot Doe for killing Tracy. A test ending for Se7en was quickly shot after the above sequence involving Somerset killing Doe was storyboarded, and it basically was the released finale -- Mills killing John Doe -- minus some of the film's "most dramatic moments," according to The Flesh Farm. The site also reported that audiences went nuts for this conclusion in preview screenings, and producers were so impressed with this response to the Mills conclusion that their confidence in the head in the box version grew. In the end, they decided not to even film the alternative, storyboarded version that they’d devised around Somerset. Something that we should all be truly grateful for. According to Shortlist, another version of the script, and one of the first to have been created, would have seen John Doe shooting and killing Mills, only to then be shot by Somerset in return. The studio believed that this would be a more dramatic and satisfying conclusion for the film, even though it really wouldn’t have made too much sense and would have just been a lacklustre cop-out that turned Se7en into pretty much every other movie of its ilk. 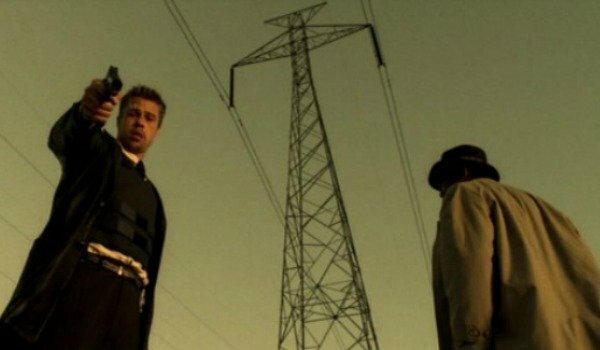 One of the most gratifying elements of Se7en is just how smart and meticulous its villain is, as he is proven to be ahead of the film’s heroes almost every step of the way. In fact, the only time that Mills and Somerset outmaneuver Doe is when they illegally track down his library movements, which results in their chase outside of his apartment. Something that should have culminated with the death of Mills, but only didn't because Doe wanted to complete every tiny detail of his meticulous plan. Another early verision of Se7en's script, according to The Flesh Farm, had Somerset recovering in hospital after being shot by Mills. Why did Mills shoot Somerset? What happened to Doe? We’re still not sure. All that we do know is that R. Lee Ermey’s police captain comes in to the hospital and presents Somerset with a letter from Mills that reads, "You were right. You were right about everything." Which I believe suggests that Mills killed Doe, and Somerset and Mills then had a brief stand-off which resulted in Mills shooting his partner, and he was then arrested. That's speculation. Is it just me, or does that sound even more depressing than the released version? David Fincher’s preferred version of the finale would have been to completely edit out the suffix to the film where Somerset delivers the Hemingway quote. Fincher explains on Se7en's DVD commentary (at the 11 minute and 30 second mark) that he had planned to cut to black after Mills shoots Doe in the head. Then, he wanted a few moments of darkness and silence in cinemas before the credits rolled so that it could sink in. Unfortunately preview screenings saw this plan scuppered because the lights immediately came up when the film concluded, lessening the effect of the sudden brutal assassination of John Doe. It didn't help that, during testing, viewers were immediately handed comment cards to answer, too. Fincher eventually caved to studio pressure to provide a coda, and even though neither Fincher, Pitt or Freeman care for it (something that they each mention in the commentary, with Pitt calling it "irrelevant," Fincher noting his disdain for the quote and Freeman declaring that it was a cop-out), they still created it. Personally, I think it provides the right amount of hope, while also accentuating the repercussions of Mills actions and the lasting effect of what John Doe has done, and it's one of the many reasons why Se7en is regarded as a bona-fide masterpiece.